It is hard to believe that this experience is almost over. There are times when I can’t wait to get home, but most days I can’t believe how fast it has gone. Choosing to spend a semester away from campus is never an easy decision. For me, I loved my campus, my community, and my classes at Dordt so I never even considered spending a semester somewhere else. I was comfortable where I was and didn’t want that to change, yet I found myself in endless conversations with friends, family, and advisors about off-campus opportunities. After a little (read: A LOT) of coaxing, I started looking into Chicago Semester. I knew that if I was going to consider an opportunity like this it was going to have to be for a great internship experience, good classes, and fun people. I am happy to report that all my expectations have been met and far exceeded. 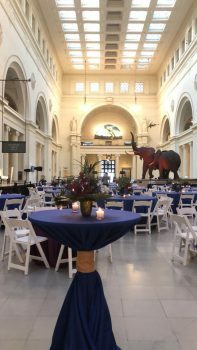 I have the unique opportunity to work with the Women’s Board of the Field Museum. My days consist of communicating with members over the phone, emailing, attending meetings, working out event logistics, running errands, processing payments, updating the website with member information and so much more. Every day I am met with new opportunities to learn and grow. I have grown so much in my confidence level and have been challenged to take on tasks that I usually would’ve never dared to. My favorite part has been the events. I was able to work a special reception the night before our new mummies exhibit opened and this week I get to work our annual Women in Science luncheon where we welcome Dr. Jane Goodall as our keynote speaker. These two experiences have opened my eyes to the level of detail and work that must be done in order to make an event a success. I love that events take creativity, design, and imagination but also require the ability to problem solve, troubleshoot, and make tough decisions. At the end of the day, all that matters is that the guests have a great time! Overall, I knew this semester would challenge and shape me, but I had no idea how much spiritual, professional, and social growth I would experience. I have been so blessed by the community I found through this program. I have met so many new people and some who I know will be lifelong friends. We all have different backgrounds, college experiences, and career goals but we have been able to connect through this new experience of living in a city and working full time. 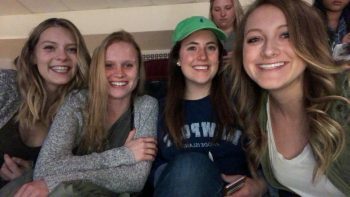 I am so thankful for the ability to find friends that make it feel as if I never left my college campus. One last exciting thing is that my family was able to visit this past weekend. 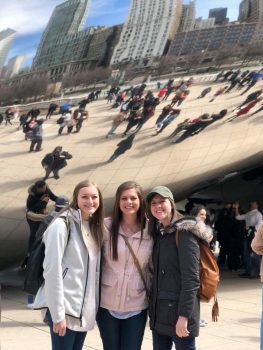 I had the best time showing them around the city. The visited me at the Field Museum, we saw the aquarium, walked Michigan Avenue, visited Navy Pier, went up the John Hancock building, ate lots of delicious food and shared a wonderful Easter Sunday together. I have absolutely loved my time in Chicago so far and can’t even begin to explain all the things it has revealed to me. I still have one year of college left and I am so excited to see how I can implement all I’ve learned back into my life at Dordt. But my time here isn’t over yet, so here’s to the next four weeks of abundant learning and adventures ahead!